Back in the infancy of social media, when you posted on Facebook, the majority of your followers saw your posts. But then Facebook began applying algorithms to determine which of your posts your followers might be most interested in—and the average user’s reach plummeted. So even though you may have lots of fans following you on your Facebook author page, many are probably not seeing your posts. 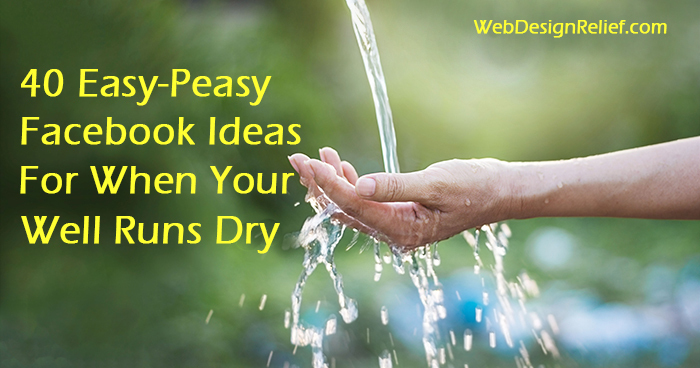 According to the social media experts at Web Design Relief, the best way to reach a wider audience on Facebook and to promote your book is to utilize Facebook ads. Many writers tend to be a bit introverted and not inclined to toot their own horns. However, if you want to boost your book sales, you’re going to have to put modesty aside and grab that megaphone! Try to put yourself in the shoes of a potential reader. Why would you choose this book? What are the most interesting aspects of the book that you would like to share without giving too much away? Why should someone read YOUR book and not one of the many others out there? Your book is your baby, and like a proud parent, you might assume everyone is fascinated with every minute detail of your baby. And you may be tempted to get your dollars’ worth by overcompensating and writing a lot of descriptive text. But more is not necessarily better when it comes to ads on Facebook. In most cases, potential readers will be scrolling through their Facebook feeds and see your ad. Dense, lengthy paragraphs are likely to dissuade potential book buyers from reading your ad. 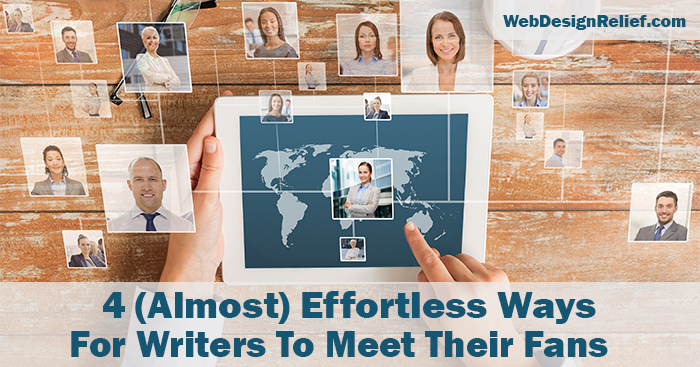 You need to grab your readers’ attention and pique their interest—fast! And be sure there’s a clear call to action. It can be as simple as: Buy your copy today! Videos and images help Facebook ads stand out and grab attention in the competition for your audience’s awareness. The most obvious image choice: your book’s cover art! After all, your book cover is your best point-of-purchase sales pitch. In bookstores, the cover plays a big part in getting people to walk over and pick up your book—yes, people do judge a book by its cover. It’s the same with ads on Facebook. You might also consider using artwork or video that suggests the themes and genre of your book. Facebook ads allow for very specific targeted marketing, which is excellent for pinpointing the audience most likely to be interested in your book. It also eliminates wasted spending. For instance, if you write strange, supernatural tales, you can target your books to fans of Neil Gaiman or Stephen King. Gather a list of other books and authors similar to you and your book, and plug them into the interests section of Facebook’s audience targeting tool to promote your ad to the widest—and most likely to be interested—audience. 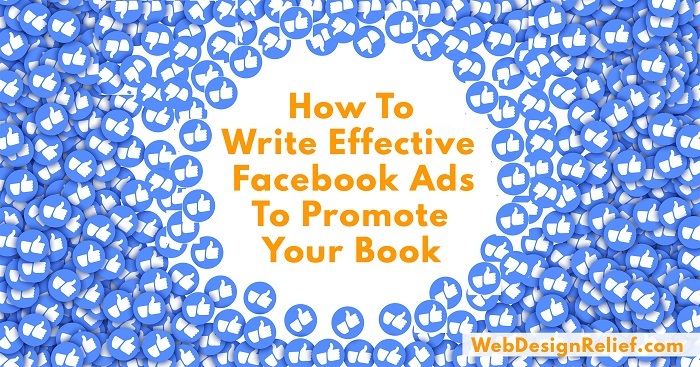 Advertising your book on Facebook can be an affordable way to reach a larger audience and boost sales. In addition to creating new ads using Facebook’s ad manager tool, you can spend as little as $10 to boost an existing post! Question: Let us know about your experience with Facebook ads! Have you found success with them or are you going to steer clear? As an author, you know how important it is to constantly connect with your fans and followers. The social media experts here at Web Design Relief know that making strong connections is the best way to grow your author platform. With all the rapid changes happening with social media, you might think that Facebook has become old news. The fact is that over a billion people use Facebook daily! So it makes sense to maintain an active presence on this social media platform. But sooner or later, you’ll probably find yourself too busy multitasking or hitting a big wall of writer’s block—and you won’t have any ideas for your next Facebook post. You need inspiration—fast. Post a photo of an early page of your manuscript-in-progress (no spoilers!) as a teaser. Post a photo of your to-be-read pile and ask others to post theirs. Post photos of your oddest research books (on poisons, medieval privies, Roman road-building, etc.). Keep track of your writing progress and post word or page counts every morning or evening. Share a positive review about your work. Share a positive review about the work of a colleague. Recommend a colleague’s book in a short Facebook video. Post a photo of your favorite reading nook. Share visual details about one of your books. These could include details of setting, character, costume, or props, either through a Pinterest page or individual photos. Check out this National Day calendar and comment on the day’s options. Post your favorite inspirational or literary quote. Ask: What’s your favorite movie of all time? Ask: What’s your favorite book of all time? Ask: What’s your favorite television series of all time? Ask people to post images of their favorite rock band, country singer, or opera diva. Post a baby picture of yourself and ask others to share theirs. Post a photo of your pet, or someone else’s pet, or a pet you’d like to have. Post a photo of an odd-looking cloud, a new blooming flower, sun coming through tall trees, or a duck on a pond. Play with GIFs: Ask your followers to describe their day in a GIF. Ask your followers to post what they’re doing in a GIF. Ask your followers to type their name in the GIF bar and post the first GIF that comes up. Ask your followers to show their spirit animal in a GIF. Take a poll to tease your fans into engagement: Paper or plastic? Seat up or down? Coffee or tea? Beer or bourbon? Cake or pie? Beards or clean-shaven? Hemingway or Fitzgerald? Austen or Brontës? Confess your teenage movie-star crush and ask your followers to confess theirs. Ask your followers to describe their life/day/job/family in one, two, or three words. Post something from your bucket list and encourage fans to respond with something from theirs. Ask your followers what their book clubs are reading. Ask variations of the question “What is your favorite…” Options may include: favorite rainy day activity, meal, color, time of day, etc. Post an odd or hilarious photo and ask folks to caption it. Post photos of the most amazing bookstores and libraries from around the world. Post photos of places you’d love to visit. Thank your fans and followers and tell them how you appreciate all the reviews they’ve written for your books (a subtle reminder to post more!). Ask your followers what other genres they read besides yours. Ask your followers to share their favorite children’s book. Ask your followers which book format they enjoy most: hardcover, paperback, audiobooks, and/or e-books? Ask your followers if they prefer to read e-books on their phone, a tablet, a dedicated e-reader, or on their desktop or laptop computer. Share with your followers some ideas you have for future books. Facebook is all about building connections by sharing and caring, so make sure to like and respond to all comments to keep the conversation going. It’s likely that all that engagement will fire you up and spark new ideas for Facebook posts that’ll inspire your followers and attract more fans. Question: What kind of Facebook posts have inspired the most engagement on your page?